My name is Folajimi Adesanya. I am currently a fourth year medical student of the University of Ibadan. I am privileged to be the Chief Administrator of the Panacea Project, a social research organization that is committed to solving communal problems. Can you tell us about the Clinton Global Initiative University (CGIU) and the Resolution Social Venture Challenge? Earlier this year, one of the projects we started running was the “Clean City Initiative”. It is meant to be a project that addresses the Plastic waste problem in the city of Ibadan through a model of sensitization, collection, recycling, exhibition and sale. So we applied for the Clinton Global Initiative University (CGIU), an initiative of the Clinton foundation run by former US President Bill Clinton. 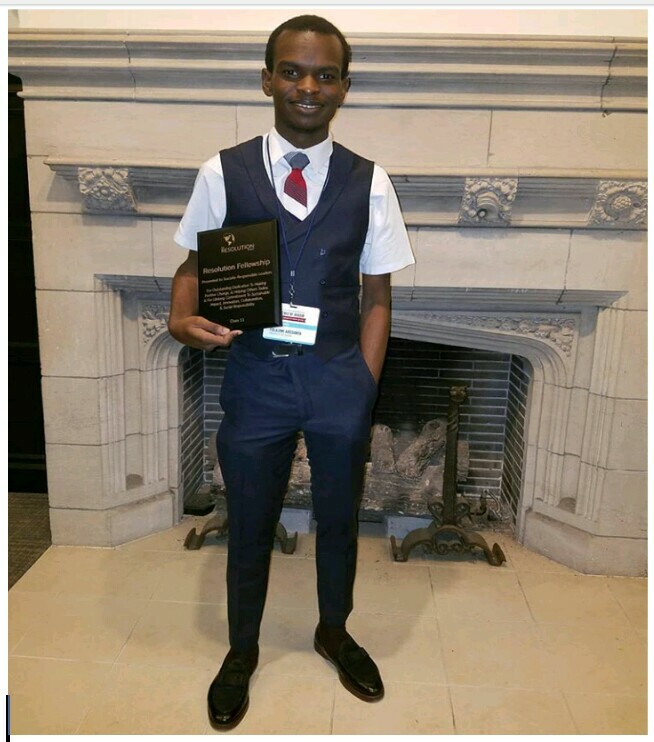 The purpose of this initiative is to amplify the works of undergraduate student leaders addressing social problems and driving change in their communities all around the world and part of being a member of this program is the opportunity to get funding to attend the 2018 meeting that was to hold at the University of Chicago. 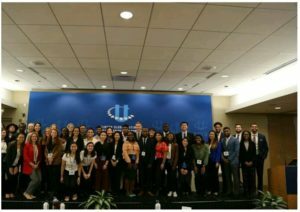 Along the line of our registration and formalities of the process, we got to know about the Resolution Social Venture Challenge which is a multistep teaching competiton that was going to be holding at the CGIU meeting for this year. So we applied for the Social Venture Challenge. It is a multistep process. After we finished the first step back in July, we were informed in August that we had made it through to the semifinals from the 140 submissions and would be going through the second and third steps in person at the meeting. At the meeting, we went through the semifinals and we were selected to be part of the 17 finalists out of the 29 semifinalist. Eventually,we were part of the 12 winners. The experience was good. The experience has given us the opportunity to refine the model of our initiative and our intervention. 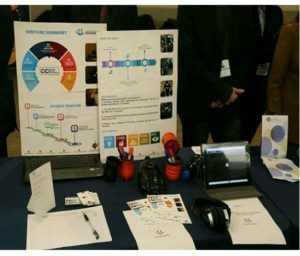 Throughout the process, we consistently got feedback from the Resolution and from CGIU, the ideas we needed to change to make the project much more sustainable. So I can say it has been a platform for us to have a strong model for our intervention of the problems. How does one get such opportunities to participate in a program like that? The way the CGIU is modelled is such that there are meant to be representatives from each university that would be members of the CGIU network but it is quite unfortunate that in Africa, there are only two Universities that are currently part of the CGIU network and they include the Ashesi University in Ghana and University of Capetown in South Africa. There is no University in Nigeria that is a member of the network, so this opportunity is one that is not very common. But over the coming months, we hope to establish a network for CGIU in the University of Ibadan to bring it to the consciousness and awareness of UIMSAites. To be able to participate in the Social Venture Challenge(S.V.C), it is simple. You just need to be attending the conference where a S.V.C is holding. Resolution goes to conferences that have undergraduate students because the S.V.C is only for undergraduate students. They go to conferences that have undergraduate students and run the S.V.C. CGIU is just one. They go to the Youth Assembly at the United Nation that holds in New York, One Young World summit that holds in different places including Netherlands this year, Colombia last year and next year in London,The Mastercard Foundation Scholars Connect Program etc. Once you are attending a conference that Resolution would be present at, you can compete in the Resolution Social Venture Challenge. The first step is to get yourself into a conference that Resolution would be present at. We were lucky to be present at the CGIU this year where Resolution was coming. Afterwards, you need to have a project you are going to be pitching. Resolution does not require for your project to have launched. Actually, they prefer projects that are just in their ideation phase, although you must have written your theory of change. This is because the funding you are going to get is meant to kick-start your work so it is one of the few opportunities available for projects that have not started. But if your project has started, it’s even better for you because that way,you have more stories to tell them and it gives your work more credibility. But if you have not started and you have your theory of change and a Proposal,then go for it. Resolution would be happy to fund you. So that is what is important for now. As someone with many achievements and experiences,may we know what or who inspires you as a person? I’m inspired when I see young people like myself who are changing the narrative in the community,who are doing something different,who are stepping out of the conventional to make lives better. Once I see, hear or listen to that, it keeps me going. What advice do you have for the upcoming generation that may wish to be like you? (Laughs). Well, I’m still part of the upcoming generation. I don’t think I’m willing to leave that age bracket yet. The most important thing is to surround yourself with people that share your dreams and aspirations because they would push you to do things you ordinarily would not see yourself doing. About 14 months ago,I was a completely different person from the person I am now, but what changed my life was my contact with a particular person. I never met the person physically or spoke to the person. I only saw the person’s social media profile and that was what changed my life. It was that simple. So that person was the beginning of it all for me. It was just seeing the person’s social media profile and me being challenged from it, that if someone in my shoes can be changing lives and influencing people in this manner, then why can’t I do the same? So surround yourself with people that would challenge you, know what you want. The thing is, not everyone may want to do something different but truth is,everyone should be willing to do something different. Also seek for opportunites. I know hundreds of people who are doing really great things but are not seeking for opportunities to amplify their work. Also, I know people who have not done so much but due to their ability to seek for opportunities,the little they have done has been amplified so much. So we should be willing to seek for opportunities and go for them. There would be rejections but that should not deter you. When you apply for something,you should not have it in mind that you want to get it in the sense. See the application as a platform to build your idea, because when you apply, you would be asked to provide certain things and once you do those things,they build your idea up for the next opportunity you have. So don’t let the “nos” you get discourage you from pushing or moving on. Thank you Mr Folajimi.It has been nice having you.